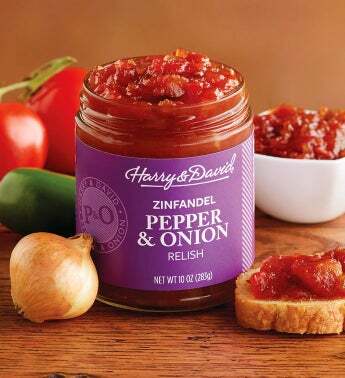 Effortlessly create gourmet hors d'oeuvres with this delightful spin on our pepper and onion relish, which is crafted with tomatoes, jalapeño peppers, and red bell peppers. The addition of Zinfandel wine adds a touch of unique flavor to this sweet pepper relish. It's just one of the many gourmet sauces and relishes available on our website. Be sure to check out the rest of our collection of gourmet food online as well.